You'll be £10.39 closer to your next £10.00 credit when you purchase Growing Remembrance. What's this? Planting began in 1997 and was supported by hundreds of organisations both serving and retired. Among the early memorials was a life-size wooded polar bear, for 49th Division, a grove of Irish trees for the Royal Irish Regiment, an Avenue of Chestnuts for the Police and a Chapel of Peace and Forgiveness to mark the coming of the Millennium. Britain’s war-widows had a rose-garden planted for them while the Far East Prisoners of War managed to fund a small museum to stand alongside a length of railway track brought back from the notorious Burma Railway. In October 2007 HM the Queen confirmed the importance of the site when she opened the Armed Forces Memorial to commemorate all service personnel lost on active service since the end of the Second World War; this is especially poignant given the on-going conflicts in Iraq and Afghanistan. The importance of the National Memorial Arboretum is well demonstrated by the growing number of stands and the steady increase in visitor numbers. 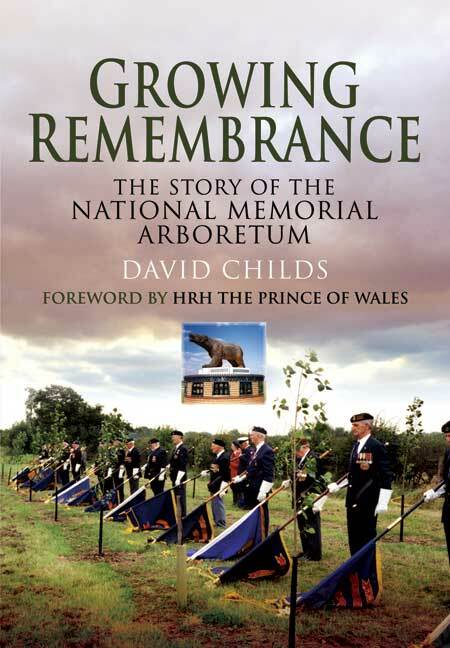 The author is David Childs who conceived the idea of the tree-studded site and then went on to establish it. His concept was to plant trees as a living tribute to those who died while serving their nation in an age of violence. The 170-page book tells of the bravery of many of those remembered there but I was particularly interested in the organisers' dilemma over what to do in commemorating the deaths of those who were shot by their own side for desertion. Childs tells the story of the 20- hear gestation and frution of his idea for a place of national remembrance of those who died in the conflicts of the 20th century and those others whose wartime endeavours the present and succeeding generations owe their freedom. He recounts how the idea came almost literally in a dream. While on a duty visit to Washington at the end of the Cold War, Childs went to see the National Arboretum on New York Avenue, and Arlington National Cemetery across the Potomac in Virginia. The next morning he "woke up with the two places i had visited combined in my mind". Then on the flight home he read of the Major Government;s initiative to establish a national forest in the midlands: "It seemed obvious tat this was where the National Memorial Arboretum would have to be." Although the names carved in stone will remain for many generations, their hallowing at Alrewas is intended to be part of a wider spiritual process, which prince Charles, who attended the dedication of the memorial in 2007, writes of in his foreword to growing Remembrance: "Memories inevitably fade, but here at the National Memorial Arboretum the memorials linked to them will flourish. That is its genius and its joy." Extremely moving account of a symbol of national pride. As the number of WW1 and WW2 veterans diminishes with each passing year so it becomes more important that we have something to focus on, to remind us of the sacrifices they made on our behalf. Humbling. David childs is the author of Tudor Sea Power. He has recently stepped down from the post of Development Director of the Mary Rose Trust, where he was responsible for the new museum. A frequent lecturer on Tudor naval subjects, he is the author of The Warship Mary Rose and a recognised authority in the field.